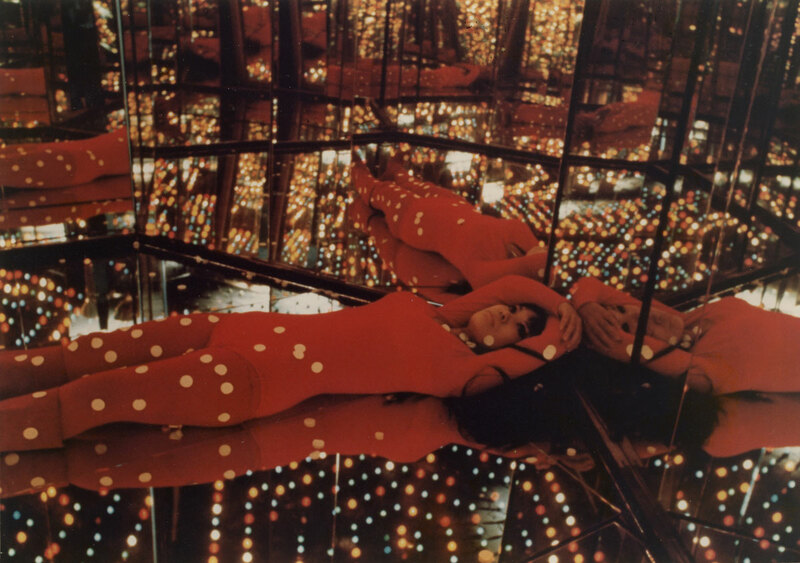 Organized in rough chronological order, Yayoi Kusama: Infinity Mirrors begins with the artist’s milestone installation Infinity Mirror Room—Phalli’s Field (1965/2016), a dense and dizzying field of hundreds of red-spotted phallic tubers in a room lined with mirrors. 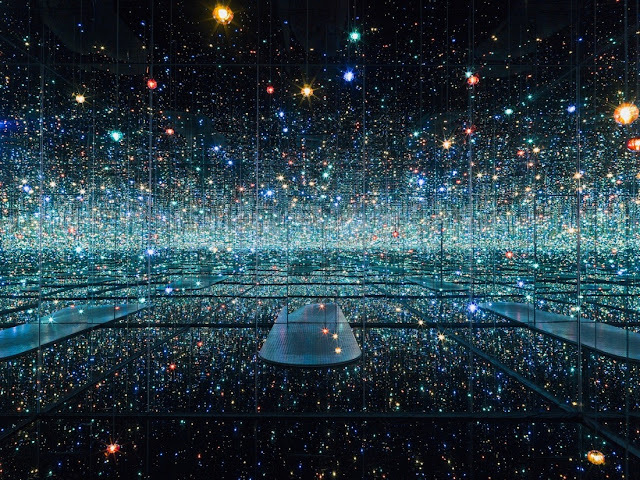 The exhibition will also include Infinity Mirror Room--Love Forever (1966/1995), a hexagonal chamber into which viewers will be able to peer from the outside, seeing colored flashing lights that reflect endlessly from ceiling to floor. The work is a re-creation of Kusama's legendary 1966 mirror room Kusama's Peep Show (no longer extant), in which the artist used to stage group performances in her studio in the late 1960s. 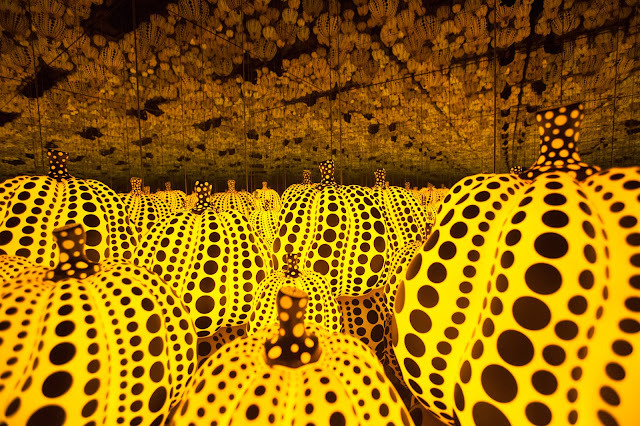 Kusama’s signature bold polka dots will be featured in Dots Obsession—Love Transformed into Dots (2009), a domed mirror room surrounded by inflatables suspended from the ceiling. More recent spectacular LED environments, filled with lanterns or crystalline balls that seem to extend into infinite space, will be represented by Aftermath of Obliteration of Eternity (2009) and Souls of Millions of Light Years Away (2013). A selection of more than 60 paintings, sculptures and works on paper will also be on view, showcasing many of Kusama’s lesser-known collages, made after her return to Japan in 1973. These works trace the artist’s trajectory from her early surrealist works on paper, Infinity Net paintings and Accumulation assemblages to recent paintings and soft sculptures, highlighting recurring themes of nature and fantasy, utopia and dystopia, unity and isolation, obsession and detachment, and life and death. 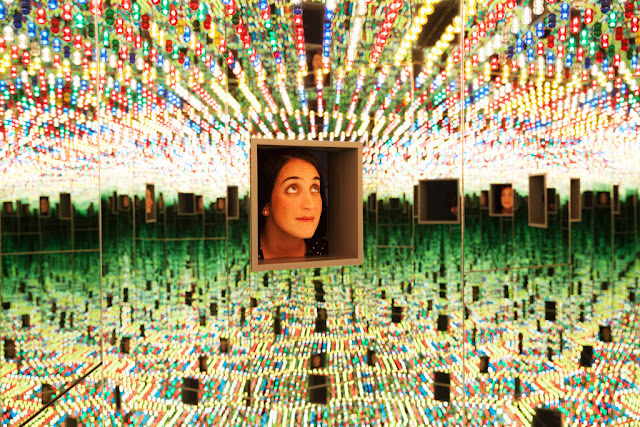 The exhibition will conclude with Kusama’s iconic participatory installation The Obliteration Room (2002), an all-white replica of a traditional domestic setting. Upon entering, visitors will be invited to cover every surface of the furnished gallery with multicolored polka dot stickers, gradually engulfing the entire space in pulsating color. Yayoi Kusama: Infinity Mirrors will be accompanied by an exhibition catalog that takes an unprecedented interdisciplinary approach to her work and includes a catalogue raisonee of Kusama’s Infinity Rooms, along with an illustrated chronology and artist biography with newly-published archival material. 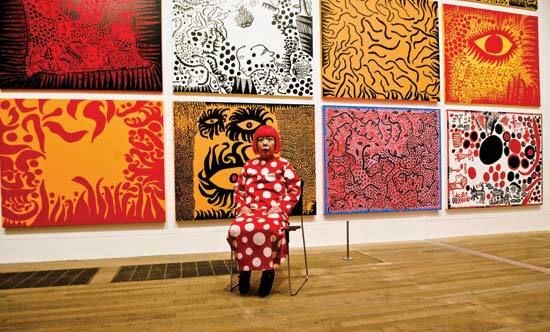 The contributing authors will introduce new research that sheds light on this pioneering contemporary artist, including essays by Yoshitake, Gloria Sutton and Alexander Dumbadze and an interview with Kusama conducted by Chiu. The exhibition will conclude with Kusama’s iconic participatory installation The Obliteration Room (2002), an all-white replica of a traditional domestic setting. 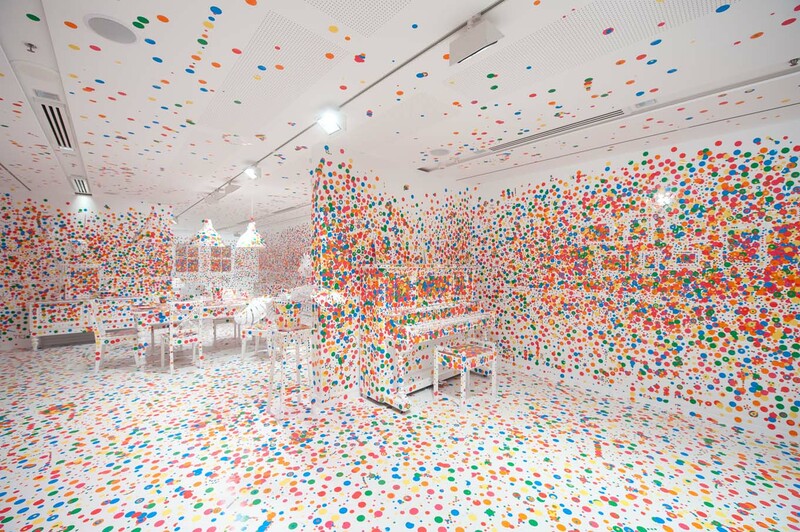 Upon entering, visitors will be invited to cover every surface of the furnished gallery with multicolored polka dot stickers, gradually engulfing the entire space in pulsating color.